I look at my dad’s cracked and dirty nails and his eye sockets bulging out as the cop walks up to the side of the car. A sheriff, hand on his gunbelt. My dad has, since the checkpoints went up, wanted to stop living along the border. It’d become unsafe. I can’t help but look at his receded gums when he talks, making his teeth seem longer. Me and my father sit on the side of the road in handcuffs for the hour it takes to run our license plates and identification. The hot pavement prickles underneath my thighs; the place where the plastic cuffs connect with my wrists has begun to chafe. When they let us go we leave without complaint, or a ticket, or an apology. “People down there think it’s the end of the world,” my dad says, when we are finally driving away. I can barely understand him through the groaning. I can’t help staring at the paper-white color of his decaying skin. But he is my father. I had been thinking about it a lot, but when it came out of my mouth I was surprised. “I want to be like you,” I said. The Plague in the Middle East. The hordes coming over the waters of the Mediterranean, and dying on the shores of countries like Greece and Bulgaria, their desiccated bodies found floating in the water, frozen in the back of meat trucks. The kinder countries say they have no place for these people, the less kind keep law and order by building fences and chaining up their dead in hospitals and football stadiums. The dead build shantytowns for themselves outside of cities, but these are quickly destroyed with fires and truncheons by people who are worried about violence and the safety of their families. Politicians close their borders and build large cement walls. In the Philippines, my father watched the president declare war on the zombies: the president was well into killing half his population—zombies, relatives of zombies, people who knew or were complicit in “zombie behavior”—before my dad completely stopped watching the news. He moans—some sort of speech impediment brought out by being freshly resurrected. It is a common sound, louder than the gurgling of the espresso steam wand. Someone yells, “Speak English!” in the crowded coffee shop. A laugh. My father stands up and leaves. I want to confront the woman who has said this, but instead, I stand up and walk by her, and simply bare my teeth. She quickly quiets. One day, I think, I’ll be brave enough to let him bite me. So he watches Already Dead in his little trailer. He is retired, and doesn’t like to leave anymore. He is old, eighty-nine or so now, and when he died the first time it was because of heart disease. Now he eats whatever he wants. Now, he fears the men who travel around in groups thinking the world is very much like this show, with their machetes and axes and automatic rifles. He thinks the show’s title is very interesting: the men, the humans, the fighting ones, they are the dead ones, with their hard hearts. That night I go out with the other members of my group, the Savers. We go out in white vans along the border and we leave packages of food—jerky, water, maps—for any of the dead who are trying to make the illegal crossing from Mexico. Legally we are in a gray area, so we try not to be caught doing it. We often run across the militias, set up along the border with camouflage gear and M-4s and night vision goggles, who come here on their vacations from jobs with dwindling benefits, jobs where they fear zombie labor overseas (as opposed to say, CEOs with high bonuses, questions of where the Plague originated). A few nights after the traffic stop I saw them shoot at a zombie. He wore a shirt from Already Dead that said “kill all zombies,” and when the real cops arrived he claimed the zombie had been dangerous, had been advancing on him in a threatening manner. He’d killed the thing, he said, because he feared for his life. On the TV they tear people limb from limb. On the news people are talking about how things can change. 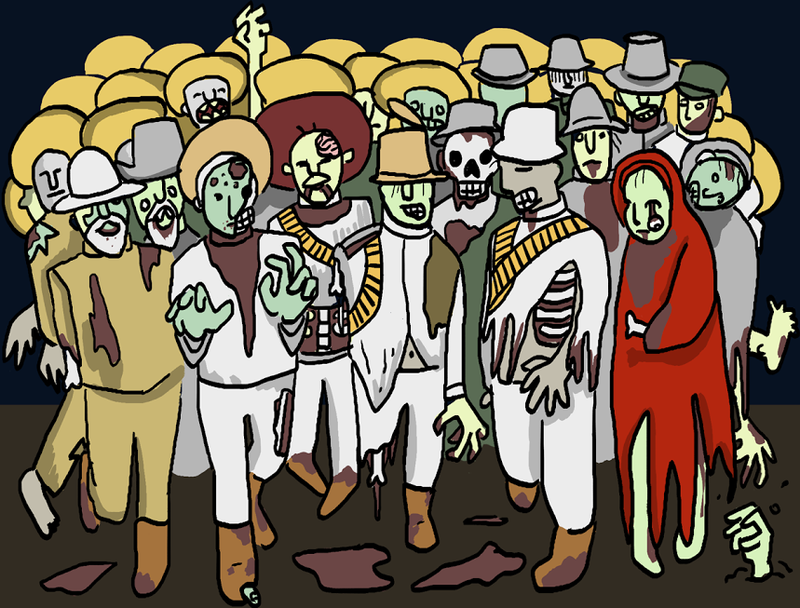 There have been mass marches on the biggest cities from those zombies still in good enough shape to make the marches, demanding rights. Mostly these are not covered by the news, and if they are they are labelled riots; martial law is quickly declared. The zombies disappear into the backs of unmarked vans. “Ayuda, ayuda,” I said, using the only Spanish I knew, but when my hand came close to him, his eyes squinted, and he crouched down lower. When he bit me it was a quick and defensive motion. I felt the teeth pierce the flesh of my hand, the sharp and burning swell. I heard the gunshot to my side, and the militia member advanced on the dead body, held the gun over the face of the small boy, and fired again. When I arrive home my father is gone. The television has been turned to a news channel: talking heads want more checkpoints as protests start in the cities over the unwarranted deaths of zombies by police, zombie shelters burned down during protests. What was thought to be a shooting done by a zombie turned out to be an anti-zombie massacre: a militia member had opened fire in a theatre, killing human and zombie alike. My hand is already starting to throb, a heavy heat, like a moist blanket, has settled over my shoulders and neck and face. A zombie expert appears on the show. “Zombies have always been the makers of revolution in cinema,” he said, “but in the Haitian tradition, they were what became of slaves who tried to escape via suicide.” One of his eyes sprouts dangerously from his head, and he must pause to keep popping it back into its socket. He says that they are angry. Although the prisons are crumbling, new private ones have sprouted to take their place, million-dollar detention centers that charge the government for everything, and have to keep every bed occupied, for profit. “So you condone the violence,” the other reporter says, shaking her head. “I understand their violence, and—” Boos overtake him from offstage. Somewhere, there is the sound of glass breaking. The pundits all shoot up from their seats quickly, and the zombie pundit, his eye dangling from his face, gets in a defensive position as he is quickly surrounded by bodies swinging at him with fists and kicks. The feed goes dead. The television shows a commercial for Already Dead. Outside I can hear it already. Gunshots and screaming, sirens. There are sounds of public unrest that just about everyone can recognize. The American imagines them in the middle of the night in the barking of a dog, in a car backfiring. They are the sounds of society leaving, of civilization walking out the door, to be replaced with fire, to be replaced with blood. I turn off the television. Suddenly, the fever has overcome me, and I pass out. Later, when I leave the house, it is with a handkerchief over my face, for the gas and smoke now clogging the air. There is already an unfettered hoard, a mass marching down the street. When they turn to look towards me, I slowly nod. We can already see the barricades of helmeted officers, the black-painted metal of water cannon riot vehicles. Behind the helmets, though, I can see the round eyes of the terrified police officers, most of whom will run when they realize there are too many of us. They will be overrun. Yes, but not only that. In every city there are already too many of us. And our teeth are sharp and that we are hungry, yes. I see the militia member in a police uniform, and push my way forward. When he raises his baton against me I shove his neck back and plunge my teeth into his neck. To the sounds of his screaming I tear out his throat. In my teeth, democracy. Finally, finally. 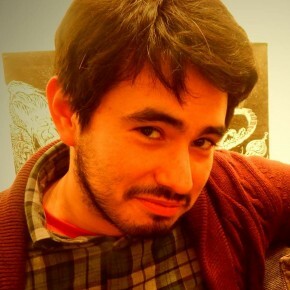 Joe Ponce holds an MFA from Columbia University. He has taught for the Fulbright Commission in eastern Turkey, and is currently at work on a book about domestic violence and immigrant families in the Americas.